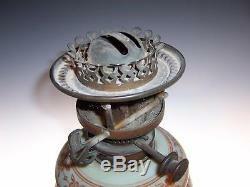 SUPERB VICTORIAN HINKS No2 TWIN RISE & FALL BURNER OPAQUE GLASS OIL LAMP. 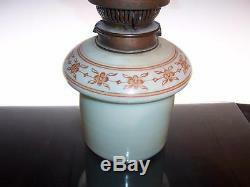 HINKS No2 Opaque Glass Oil Lamp. 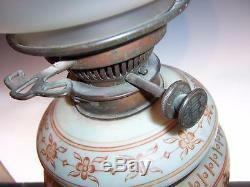 OIL LAMP, FITTED WITH A HINKS No2 LEVER RISE AND FALL BAYONET BURNER COMPLETE WITH WICKS, HAS WORKING EXTINGUISHER AND BOTH WICK WHEELS WORK WITH EASE. 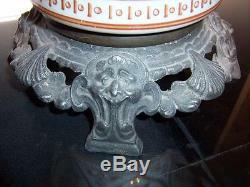 THE CAST METAL BASE IS VERY ORNATE. AS YOU CAN SEE IT IS IN EXCELLENT CONDITION, BUT THE BASE OF THE BODY IS CRACKED (SEE PIC 9), DIFFICULT TO SEE UNLESS YOU REMOVE THE FONT AND LOOK INSIDE, THERE IS NO DAMAGE TO THE FONT. 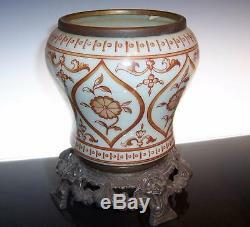 COMES COMPLETE WITH ORNATE GREEN TO CLEAR GLASS SHADE WHICH IS NOT ORIGINAL TO THE BODY BUT LOOKS GOOD. 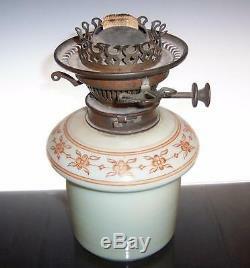 THIS EXAMPLE MEASURES 18 1/4" HIGH EXCLUDING CHIMNEY, INCLUDING CHIMNEY IT IS 21 1/2". IF YOU REQUIRE MORE PICTURES, FEEL FREE TO ASK. Show off your items with Auctiva's Listing Templates. 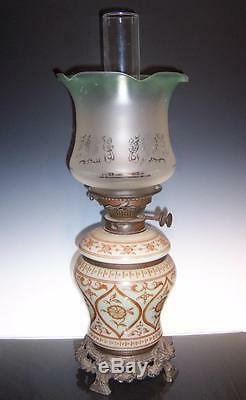 The item "SUPERB VICTORIAN HINKS No2 TWIN RISE & FALL BURNER OPAQUE GLASS OIL LAMP" is in sale since Wednesday, April 13, 2016. 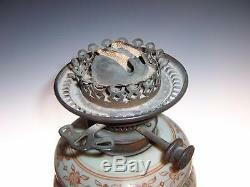 This item is in the category "Home, Furniture & DIY\Lighting\Other Lighting". 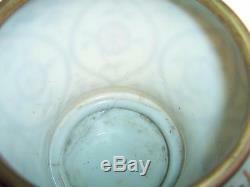 The seller is "smr1290132" and is located in Central Scotland. This item can be shipped worldwide.